Equity markets posted mixed results despite positive earnings reports. The release of the minutes from the Fed’s monetary policy meeting sent Treasury yields higher. The Leading Economic Index rose 0.5% in September, signaling a solid outlook for economic growth over the next six months. After three consecutive weeks of declines, stocks finished mixed this week. Increased volatility was still prevalent this week as investors remained cautious, with the S&P 500 moving more than 1% in two out of the five trading sessions. The S&P 500 Index finished just above the flat-line during the period, as six of the eleven underlying sectors turned in positive results. 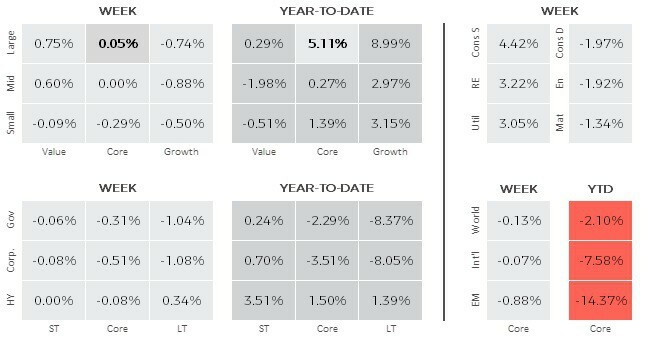 Large cap stocks outperformed small cap and value bested their growth brethren across the market capitalization spectrum. Communication services, real estate and utilities stocks led the way, while consumer discretionary, energy and materials stocks lagged. Developed non-U.S. markets weakened slightly during the period, with the MSCI EAFE Index falling 0.1%. European markets came under some selling pressure as Italy’s standoff with the EU intensified. Other developments, such as the increasing likelihood of a “hard” Brexit also weighed on the markets. Emerging markets, as measured by the MSCI Emerging Markets Index, turned in the worst relative results with a 0.9% decline. Stocks in Asia finished mostly lower as an already-skittish global sentiment was exacerbated by a lower than expected read on China’s Q3 GDP. The yuan fell to its weakest level versus the U.S. dollar in two years and the Shanghai Composite Index ended at its lowest level since November 2014. However, China’s central bank and top regulators pledged financial support aimed at reassuring the markets in the wake of the recent tumble in stocks. Fed policymakers indicated that a steady pace of rate hikes is likely to continue. The minutes also showed that Fed officials discussed the prospect of raising rates past the neutral zone and into the “restrictive” zone in an effort to slow the economy and reduce the risk of rising inflation. The yield on the benchmark 10-year Treasury increased from 3.15% at the end of trading the previous week to 3.20% at the close Friday. The ascension of yields, pushed bond prices lower, especially for longer-term Treasuries that are particularly sensitive to interest rate changes. The continued ramp up of earnings season will likely take top billing this week, with the markets scrutinizing company guidance and commentary. Meanwhile, the economic calendar will also command some attention, headlined by Friday’s first look at Q3 GDP.